Eric Holder: America Has NEVER Been Great! President Obama’s former attorney general Eric Holder has admitted to MSNBC that he doesn’t think America has ever been a great country. 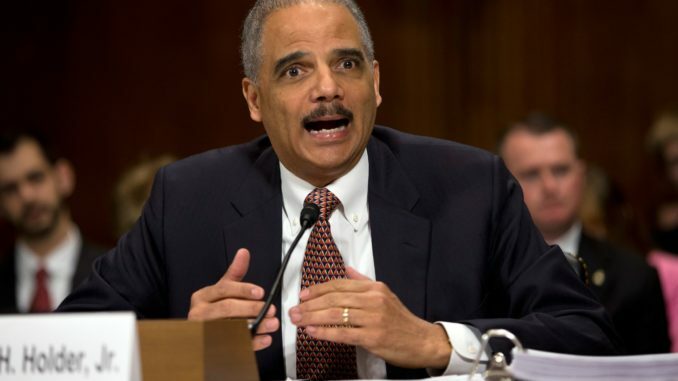 ERIC HOLDER: Well, that’s exactly right and that’s why I hear let’s “Make America Great Again,” and I think to myself “when did you think America was great? It certainly wasn’t when people were enslaved. It certainly wasn’t when women did not have the right to vote. It certainly wasn’t when the LGBT community was denied the rights to which it was entitled. MELBER: Does that phrase echo as discrimination in your ears? HOLDER: It takes us back to an American past that never in fact really existed, this notion of greatness. You know, America has done superb things, great things, and it has been a leader in a whole range of things, but we’re always a work in process. Looking back, “Make America Great Again” is inconsistent with who we are as Americans at our best where we look at the uncertain future, embrace it, and make it our own. Note, Holder doesn’t associate at all with the old America. Despite being a millionaire and working as the attorney general under our first black president, he sees our founders and the Americans who built the country in which he was able to thrive only as evil oppressors. According to Holder’s definition of “greatness,” America was only “great” for the last few years Obama was in office.